In July, Lt. Heath Meyer of the Oklahoma Highway Patrol was struck and mortally wounded while deploying a tire deflation device to stop a suspect's vehicle during a pursuit. He died days later. This is just one example of how dangerous it is for law enforcement officers to manually throw and retrieve spike strips. Pacific Scientific Energetic Materials Company (PacSci EMC) has developed an alternative that deploys and retracts remotely, keeping officers out of harm's way. To deploy PacSci EMC's NightHawk, the officer sets the open case on the ground along the road and can then stand up to 100 feet away. When the target vehicle gets near, pressing a button on a wireless remote control launches a string of spike strips across the roadway. Once the vehicle runs over it, pushing the remote control's second button retracts the strips so no other vehicles are affected. "It deploys in about two seconds and retracts in about two seconds, all from a remote, safe position," says Neal Kerr, Pacific Scientific's product line manager. "And there's no debris in the roadway to pick up." The NightHawk looks like an unassuming black case when closed. Inside are 10 Stop Sticks strung together in a polymer sleeve and tightly packed. A gas generator cartridge with a small energetic charge, similar to what's used in an automotive air bag, propels the device. When launched, a weight in the launch tube pulls the spike strips with it to create a 25-foot line across the road, enough to cover two lanes and provide 15 feet of spikes. "When you deploy the sticks, they go across in a pretty uniform fashion across the road," says Kerr. "Basically picture a triangle. Any way it lands, the spikes are always sticking up." The disposable spike strips and launch tubes can be replaced and repacked to keep reusing the battery-powered device. If an agency submits a "launch report" to the company explaining how the device was deployed in action, PacSci EMC will replace the used spike strips for free. Packing and preparing the case for use takes around 10 minutes, and officers can be trained how to do it in an hour, according to Kerr. The entire system weighs under 30 pounds for easy transport and placement. The heavy-duty Pelican case is completely waterproof when closed and the NightHawk is even designed to withstand adverse weather conditions while open waiting for deployment, including for up to 10 minutes in a torrential downpour. PacSci EMC's NightHawk seems oddly named. But Kerr says the device's spikes are akin to a bird's talons, and the system is stealthy like a bird of prey. "It's a dark color and can be placed by itself, so you don't really notice it, unlike an officer in the center of the road," says Kerr. The NightHawk is currently available, with about 250 units in the field. And its stealth has helped agencies successfully stop suspects, with one department reporting an impressive 90% success rate in deflating vehicles' tires. 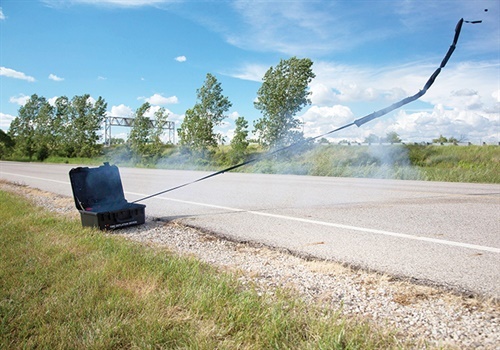 Last year, in Rockford, IL, the Winnebago County Sheriff's Department deployed the NightHawk late at night and used it to successfully stop a vehicle by deflating all four tires. The arrestee didn't see the spike strips or any officers and didn't know what had caused the vehicle to cease moving. Incredulous, he asked one officer, "Where were you guys?" PacSci EMC offers the NightHawk with 10 spike strips for $2,995 each. Launch tubes are $195 each, and battery chargers are also available. Prices are discounted for multiple orders. Free demonstrations are available for prospective buyers and training is included with purchase. "We believe the NightHawk offers officers a far safer way of stopping a vehicle," says Kerr. "The beauty is we're not changing the stopping technology, but the way that it's deployed."